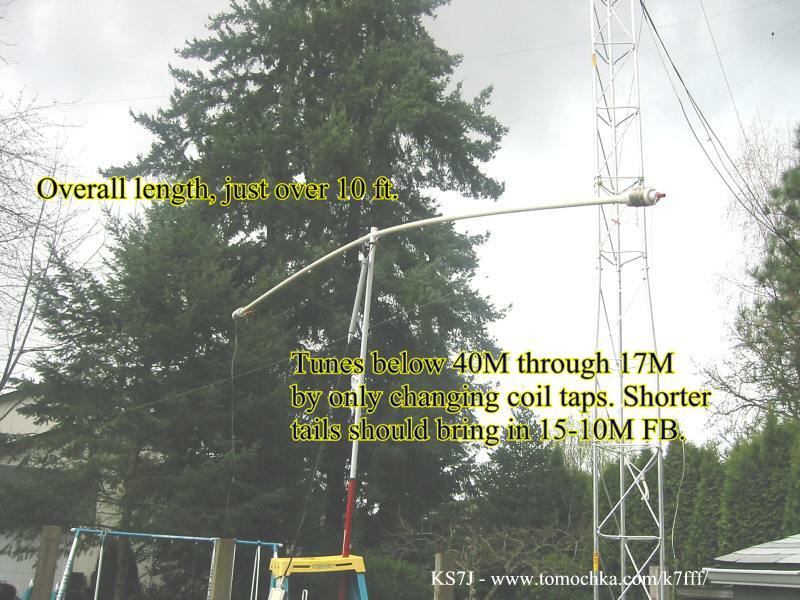 Inspired by Budd's homebrew buddipole and AK0M's big 40M coil, I set off to fashion my own version. I guess I had one overriding goal: make it as cheap as possible! Well, I succeeded in making this version for 12 bux and a few junk drawer parts and to my surprise it worked first time! One way I saved $ and space was to use vertical wire tails instead of the telescoping ends. 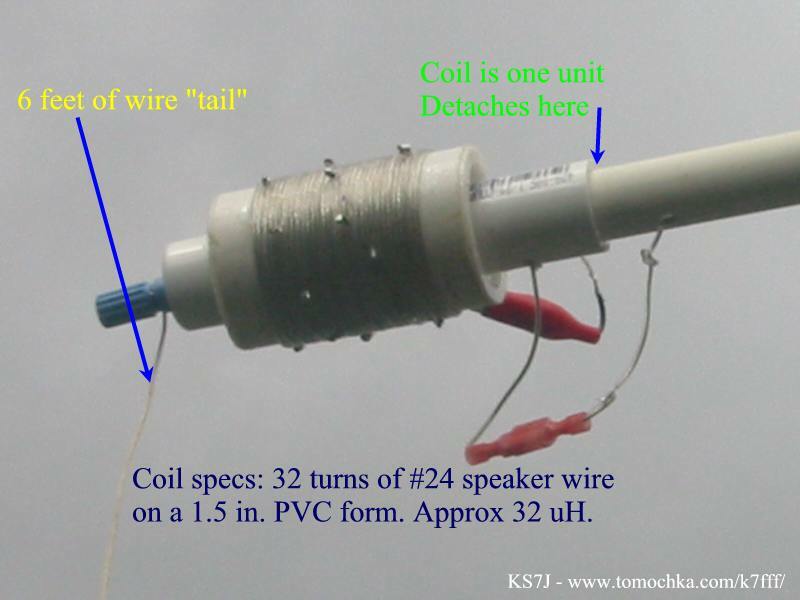 Here is my version of AK0M's 40M tapped coil. These are, of course, what took up 90% of the manufacture and assembly time for an otherwise very simple design. The coils are single integral units with the 1/2" PVC running through it and some ABS 1-1/2" breakouts for bushings. Since I had some scrap 1-1/2" PVC already I dug out my Handbook and modified the winding to match AK0M's coil. I found it relatively easy to find taps to tune new bands. It should be easy to mark them for later reference. One of my goals was NOT to make something that I would walk around with, I was after more of a campground antenna for my K1. Thus, I didn't bother to make a second joint in the arms and the arms are longer overall than Budd's original design. Adding another joint would be trivial however. I used a cross joint in the center so that I could add more pipe on top for different mounting situations. 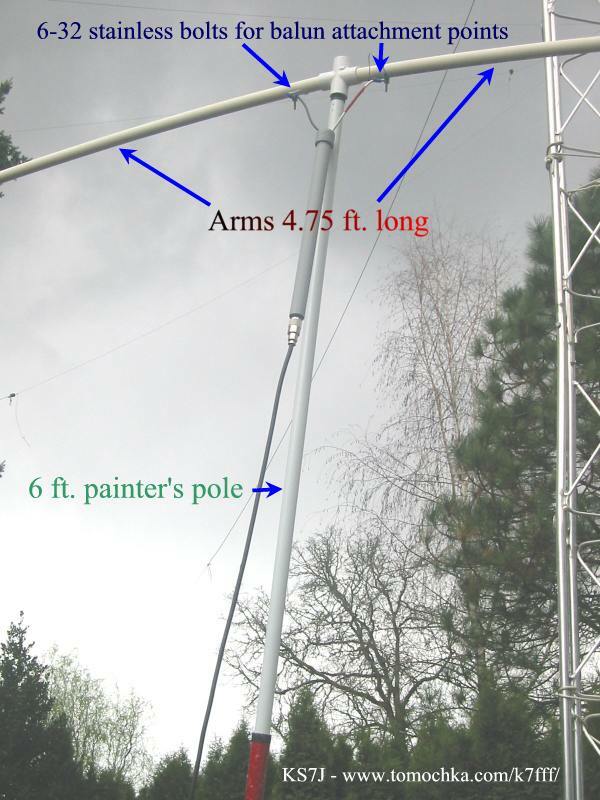 Each dipole leg terminates in a ring connector and is bolted to the arm. The bolts extend for attaching a balun (glad I had a spare handy).